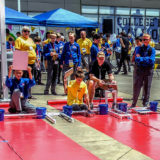 June was a very busy month for Carson Middle and STEM Tech Neighborhood Academy teams as preparations and travel for the National Technology Student Association (TSA) JSS competition in Atlanta, Georgia were top of mind. 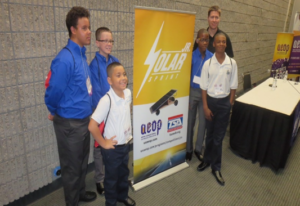 These teams were a part of Junior Solar Sprint: Connecting Communities with Opportunities for Success (JSS:C2OS), which is a pilot program bringing together the Florida Solar Energy Center, a Research Institute of the University of Central Florida and Army Educational Outreach Program (AEOP) to provide teachers, mentors and educators with the unique opportunity to experience JSS through their students’ eyes.The opportunity to travel to a national STEM conference served as a frenzy of firsts for our students and was an invaluable opportunity for teachers to truly experience the event from their students’ perspective. 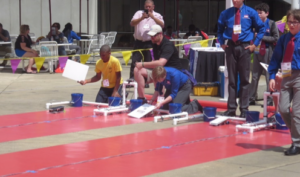 For many of the students it was their first time on an airplane, first time in Atlanta, and, most importantly, the first time at a national STEM event. The students’ excitement was infectious, and a true reminder of how necessary STEM competitions are – especially for underserved communities. Among the many activities, the time trials were especially fun because they gave students a chance to see a variety of JSS vehicle designs and they allowed the students to interact with other JSS teams from all over the U.S. as well as a visiting team from Japan. Although neither team made it to the finals, both teams took every opportunity to learn more about improving their vehicles. 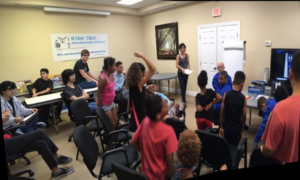 Upon returning to Florida from the conference, team members and coaches gave a presentation about their experience to the other students from STEM Tech Neighborhood Academy which is also known for its after-school technology program geared towards providing underrepresented students with hands-on STEM experiences. After their deliberation, they wasted no time starting to plan for improvements on their vehicles to “up” their game for next year’s races. Overall, this experience was a tremendous opportunity to meet students from all around the country and exchange ideas on how to enhance their skills in STEM! 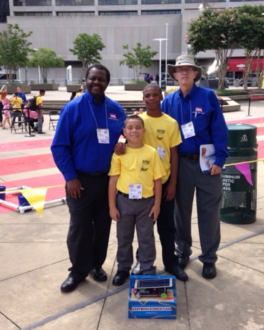 Tristen Brice from STEM Tech Academy (yellow shirt) launching the team’s vehicle.